James J. Mele was born and raised in Fresno and has a long connection with Fresno as both of his parents were born here, too. He attended and graduated from Fresno High School in 1968. While there, he was a successful competitive debater and speaker and Senior Class President. Mr. Mele attended the University of California at Davis where he continued his competitive speaking and earned a Bachelor of Arts degree in Rhetoric (Communication) in 1972. 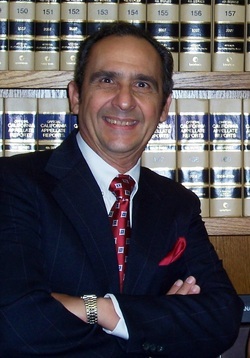 After graduating from UC Davis, he attended San Joaquin College of Law and earned a Juris Doctor Degree in 1976, and became a member of the State Bar of California that year. Mr. Mele has been in private practice since 1976 representing individuals, families, and businesses in Fresno and throughout California's Central Valley. His practice is focused on helping people who have been injured or killed through no fault of their own as the result of medical malpractice, doctor malpractice, hospital malpractice, Kaiser malpractice, automobile crashes, truck and big rig crashes, motorcycle crashes, slip, trip and falls, and dog bites and attacks. He has handled such cases involving catastrophic injuries, brain damage, pedestrian injuries, injuries to children, birth injuries, spinal injuries and paralysis. He is an experienced trial attorney and successful negotiator. Because of his experience and expertise, Mr. Mele has acted as a Judge Pro Tem for the Fresno County Superior Court handling pre-trial settlement conferences, particularly in cases of medical malpractice and other personal injury cases. He also has acted as Mediator in medical malpractice and personal injury cases at the request of both sides. Mr. Mele is often referred cases in these areas by other attorneys. Mr. Mele has authored and presented lectures to other attorneys to teach them how to handle medical malpractice cases: "Handling Medical Negligence Cases in California." Mr. Mele's practice also focuses on helping families in planning, creating and executing estate plans, including wills, living trusts, powers of attorney, health care directives, handling probate and other estates, other estate planning, and elder law. He is on a special panel for referrals from the Fresno County Bar Association Attorney Referral program to help those who need legal assistance in this complex area of law. Mr. Mele's practice also focuses on helping individuals and businesses with business, contracts, and real estate law and litigation. He has lectured for the Chamber of Commerce and SCORE on the legal aspects of opening and operating a business.